Jenő Cholnoky (1870-1950) had serious research conducted into the history of the Cholnoky family. His son, Tibor Cholnoky, (1901-1991) recorded his findings, the shortened version of which we present herein. The "legend" is not a verified catalogue of the events but it is more than likely that - even if not down to the last detail - things happened as told. "At the end of the 14th century there was a man of Serbian descent who lived at the court of Hungarian king Zsigmond, who, for faithful services rendered to the Crown, on 18th of October, 1409, received the Transylvanian fort of Hunyad as a reward. He was also given the rank of untitled nobility. Thus, he and his ilk became Hungarian nobles and took on the family name of "Hunyadi" - this included his son, Vajk. The wife of Vajk was Erzsébet Morzsinai, who came from the village of Marsina in the County of Krassó-Szörény and was of an ancient noble family. There were two boys and two girls as issues of the marriage, amongst them was János (born 1387), subsequently known as the "defeater of Turks", who married Erzsébet Szilágyi. János Hunyadi was the governor of Hungary from 1446 to 1452. One of their children, Mátyás - Mathias Rex, as known in the West - was the king of Hungary from 1458 to 1490." The Cholnoky Family - according to the suppositions - had a Rumanian member who received the village of Csincsis (in Hungarian, Csolnakos) from King Béla IV of Hungary for services rendered during the Tartar invasions of 1241-2, where he subsequently built a fortress. From this time on the family took on the Hungarian name of Csolnakosi/Csolnokosi. The patriarch, named "Péter", whose son was called Jaroszlav/Jariszlo, in 1419 married the widow of Vajk Hunyadi (see above) from whom he had four issue: Dan, Vajk, Péter, and János. Governor János Hunyadi did not forget his half-brothers, the Cholnokys, and gave them special privileges... First, he exempted the village from all taxes; then, all lawsuits were ordered to be at the jurisdiction of the local landowner, (a Cholnoky) and all appeals were to be directed not to the county but directly to the Royal Court. Furthermore, all decrees for the village had to be validated by the eldest member of the family - a Cholnoky - before they became effective. These privileges remained in effect through the 18th century. During the Diet of 1838, the county of Hunyad, in the name of the Cholnoky family, asked that these privileges remain in effect. 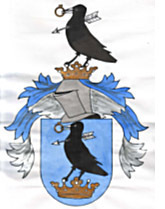 In addition to the above-mentioned nobility and privileges the Cholnokys received a coat of arms, which looks as follows: on the lower part of the shield a crown woven from gold leaf sits; on top of the crown there is a black raven, a silver arrow thrusting through its neck; in its beak it holds a gold ring, into which a ruby is set; the background is blue; the shield is topped with an armored helmet dressed in a blue-green mantle. The coat of arms bears a strong resemblance to the characteristic "raven" logo of the Hunyadi family. These facts are confirmed in an article of the Révay Lexikon [Encyclopedia] titled "Csolnakos", as well as by the noted Hungarian expert on nobility, Iván Nagy, in his work, Hungary's Families with Coats of Arms and Charts of Descent (pg. 173). In 1464, in addition to the town of Csolnakos, King Mathias Rex presented the family with the towns of Doboka and Ohaba. In 1486, King Matthias named Albert Csolnakosi captain of the fort of Kőszeg, and also presented him with large landholdings in the County of Esztergom in the town of Csolnok. In 1483 Albert Csolnakosi took on the name of "csolnakosi Cholnoky", which the family has used ever since. The other branch of the family came to Hungary from the Province of Transylvania (in Hungarian "Erdély") with István Bocskai, a prominent Hungarian statesman and soldier. One of the members, István Cholnoky, swore fealty to Habsburg King Ferdinand II, for which he received a new coat of arms in Vienna on January 31, 1625. This coat of arms is as follows: in the shield there is a triple mound of green, topped with a white lily; on top of the armored helmet sits a two-tailed golden lion; the decorative mantels	are blue-gold and red-silver. The description of the shield can be found in Five Centuries of Coats of Arms Recorded in Hungarian National Archives, by Nyulásziné Éva Straub (pg. 373). In later years the family was scattered throughout the country in the counties of Fejér, Pest, Tolna, Veszprém, Zemplén, and Szatmár; in the 20th century the migration even extended abroad.